Lacoste Challenge is a new exhilarating fragrance for men. 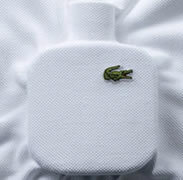 Lacoste Challenge is a dynamic and energetic aftershave designed to inspire men to embrace the life's challenges with confidence, flair and enthusiasm. Lacoste Challenge has an immediate vitality with an invigorating blend of citrus, tangerine and lemon with a hint of subtle and optimistic bergamot. This seamlessly melts into a spicy and aromatic heart of ginger, lavender and violet leaves, creating a perfect sensual harmony. Lacoste Challenge has an enduring woody base of ebony and teak wood, which creates a traditional and yet modern fragrance for men.